Time for Sunday Citar again. Find a quote that inspires you and choose a photo that goes along with it. Go to Fresh Mommy's blog to join in and see everyone else's entries. My patience has been tested lately. I think I could learn a few lessons from my dog. 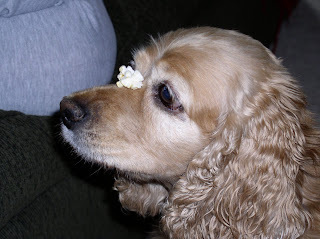 This is something my husband does to her....puts a piece of popcorn on her nose and makes her wait.....and wait....and wait...until he finally says o.k. and she snatches it up. This dog has infinite patience (at least when it comes to food). Even our dogs can teach us life lessons! You ok?? You have to have the patience, because my brother has NONE!! I love that picture and the quote is perfect. Your dog is very well trained. If my dog even gets a whiff of popcorn, he goes in for the tackle and is relentless! I'm always searching for more patience. Four kids can make it tough at times :) Great quote and cute photo. A sweet dog who knows how to wait!! Wow, that quote says a lot for just 5 words! What a pretty dog. What a good dog...and a great lesson! I wish I had Maddy's patience. I could really use it right now!! Wow, I think I need to learn from your dog. That is some patience! Maddy - what a good dog! I do need her patience as we are at the halfway point of our summer vacation! Hmm I guess it goes without saying...patience is a virtue! Very cool trick!! And a fabulous quote. Thank you so much for sharing!